I’m so excited – our Crop and Create is tomorrow! My team members Lynn, Margaret and I have been planning and preparing for this for over a month. It’s going to be such fun to see good friends, and make new ones. We have goody bags, chock full of fun & useful things, ready to present to each of our guests as they arrive. Everyone who has signed up for the Crop will have their own 6 foot long table, all to themselves, to spread out & get busy on their own projects. For those taking the Classes, all they need is their basic tool kit of scissors, adhesives and bone folders – everything else is ready for them! 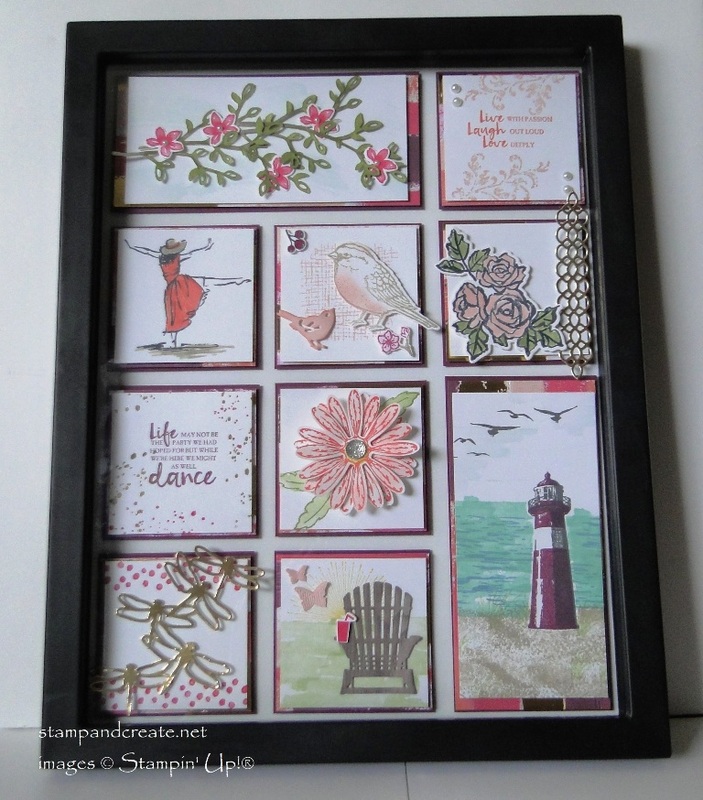 This is one of the classes; each participant will create their own framed sampler, with the frame included. I love this sampler; I think it’s perfect for the Spring/Summer season! The great thing is that you if you want, you can swap out the panel that these squares are attached to, and create another sampler for another season, using the same frame! 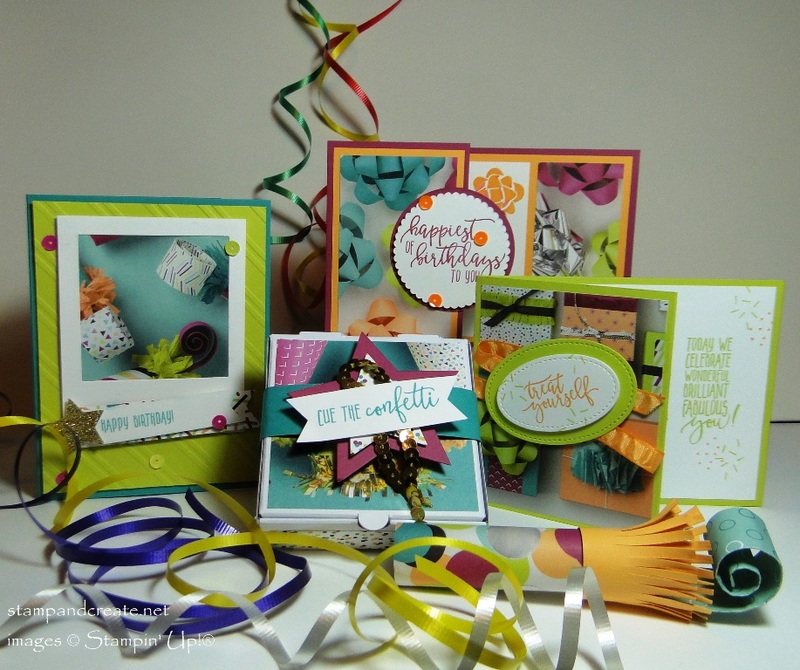 You really can’t choose a better stamp set than the Picture Perfect Birthday for a birthday themed class! Combine it with the fun Picture Perfect Party Designer Series Paper, and it’s guaranteed fun. For this class there is the ‘polaroid’ theme card, and a fun Z fold card. One gift card holder looks like a card, but has a little pocket inside to fit a gift card. The second gift card holder is made from the Mini Pizza box – adorably decorated! That fun noise maker in the front isn’t a real noise maker – but a roll of LifeSaver candies disguised as a noise maker! Did I mention the prizes?! Well, we’ll be doing prize draws throughout the event, but I’m keeping them a surprise for everyone! We are having a whopping Door Prize – of a Stamparatus! Yes, one lucky person will WIN a STAMPARATUS before it can be purchased! Be sure to visit my blog on Monday, as I’ll be sharing pictures from our event! While you’re waiting for Monday to come around – be sure to check out the Retiring Products! Some have already sold out, so don’t wait too long to decide. Click on my signature below to go to my online store, and have a browse around! Order online, and have your delivery straight to your own door. Don’t forget that you can also order the new In Color ink pads, as well as the Share What You Love Bundles! Next Next post: Crop and Create Fun! This looks like so much fun! I can’t wait to see pictures!